After a stroke, the primary approach to healing and recovery involves an active rehabilitation plan to improve physical abilities and cognitive function. There are a number of different types of post-strokepost stroke rehabilitation, and if you are recovering from a stroke, you will likely need to participate in one or more of these. Physical therapy includes a variety of muscle maneuvers and exercises. Post stroke physical therapy activities are designed to train the brain and the muscles to work together using an approach that builds muscle strength and maintains healthy muscle tone. A recent study from the United Kingdom used data from the Cochrane database, one of the largest stroke survivor databanks, to evaluate the effectiveness of physical therapy after a stroke. The results of the UK study concluded that there is a wide range of physical therapy techniques and methods used around the world for recovering stroke survivors. While the researchers did not find that one kind of physical therapy was better than the others, they did conclude that physical therapy is effective for helping stroke survivors improve mobility (the ability to get around,) walk at a faster pace, function more independently and have better balance. Researchers estimated the ideal dose of physical therapy to be approximately 30-60 minutes 5-7 days per week. Physical therapy was also found to be more effective when the sessions were initiated shortly after the stroke. Unlike physical therapy, occupational therapy is a more task-focused type of training. Occupational therapists work with stroke survivors on practical, real world day-to-day tasks such as climbing stairs, getting in and out of bed and getting dressed. 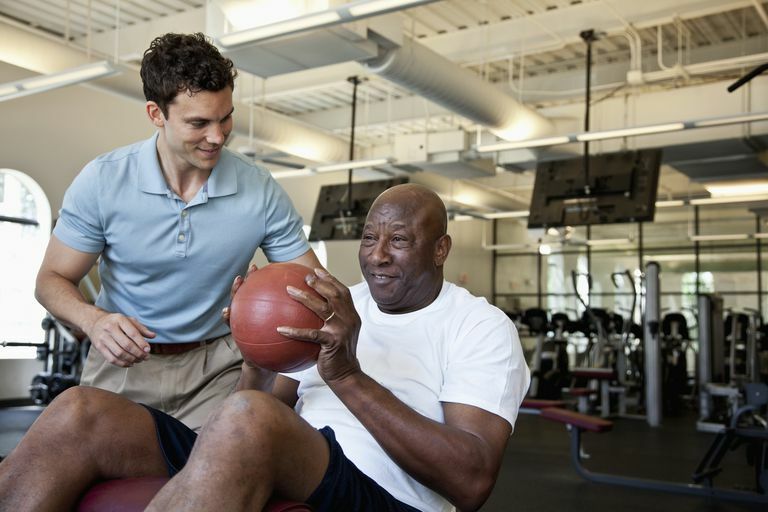 Of course, there is an overlap between physical therapy and occupational therapy, and the two are both key components of stroke recovery, but physical therapy is more focused on strengthening and maintaining tone of target muscle groups, while occupational therapy is more focused on coordinating and using muscles for certain directed goals. Speech and swallowing are skills that require thinking about the action while coordinating muscles. Both skills use muscles of the face, mouth, tongue and throat. Speech problems are often expected after a stroke, while swallowing problems are usually more of an unpleasant surprise for stroke survivors and their loved ones. A speech and swallow evaluation is typically done in the hospital, within days after a stroke. As you recover from your stroke, your speech and swallowing abilities might begin to get better on their own. Speech is important for communication. Speech requires the use of language to understand what people are saying. Speech also requires the use of language to communicate with others. Speech therapy is focused on understanding words as well as on producing words that others can clearly understand. Sometimes, speech therapy involves flashcards, pictures, and, of course, practice and repetition with speaking. Swallowing is important for a number of reasons. Nutrition is a vital part of life, and that doesn't change after a stroke. Swallowing ability is necessary for maintaining good nutrition. However, properly coordinated swallowing is important for other health issues, in addition to nutrition. When swallowing muscles do not move as they should, choking on food is one of the dangerous consequences. Choking can cause an infection called aspiration pneumonia, which is a bigger problem among stroke survivors than most people realize. Choking on food can also result in a dangerous lack of oxygen, which can cause brain damage and even brain death. The consequences of a swallowing disability are not something to be ignored. Fortunately, there is a whole system in place for swallow therapy to help stroke survivors avoid these serious and scary complications of stroke. Visual therapy and balance therapy are often scheduled in combined rehabilitation sessions for stroke survivors. That is because vision partially relies on good balance and balance partially relies on good vision. The areas of the brain that control these two functions are separate, but they depend on each other as they interact. This is why it makes sense that post stroke balance exercises incorporate visual skills. A recent medical research study that involved a collaboration between researchers from Memphis, Tennessee and from Denmark concluded that 60 percent of the stroke survivors who participated in combination vision therapy and balance therapy were employed, compared with only 23 percent of stroke survivors who did not participate in the therapy. Cognitive therapy is still a fairly new concept in stroke rehabilitation. Cognitive therapy involves interventions that are designed to improve thinking skills and problem solving abilities. There is a range of cognitive disability after a stroke. Stroke survivors who are recovering from a large cortical stroke often have more cognitive issues than stroke survivors recovering from a small vessel subcortical stroke. Left sided cortical strokes cause somewhat different cognitive deficits than right-sided cortical strokes, and this can impact your road to recovery as a stroke survivor. Cognitive therapy approaches such as using video games, virtual reality techniques and computer generated rehabilitation therapy are currently being studied as ways to improve cognitive function after a stroke. Among the various interventions for post stroke cognitive deficit, the best type of cognitive therapy has not yet been established. However, so far, the conclusion is that stroke survivors who participate in cognitive therapy recover better than stroke survivors who do not participate in cognitive therapy. New types of therapy include mirror therapy, electrical therapy and music therapy. Stroke survivors who participate in research studies that use new and innovative rehabilitative therapies tend to test better on measures of stroke outcomes and usually do not experience negative effects caused by experimental rehabilitation. The preliminary data on recovery after a stroke are promising, but research scientists always consider the possibility of a 'placebo effect.' A placebo effect is the likelihood that a person who is having an intervention will improve due to the preconceived belief that the intervention will help. A placebo effect can make an intervention appear to be beneficial even if the intervention is useless. There is probably a degree of placebo effect and a degree of usefulness when it comes to most of the innovative rehabilitation techniques that are currently under research. Choi YH, Ku J, Lim H, Kim YH, Paik NJ. Mobile game-based virtual reality rehabilitation program for upper limb dysfunction after ischemic stroke. Restor Neurol Neurosci. 2016;34(3):455-63. Pollock A, Baer G, Campbell P, et al. Physical rehabilitation approaches for the recovery of function and mobility following stroke. Cochrane Database Syst Rev. 2014;(4):CD001920. Schow T, Harris P, Teasdale TW, Rasmussen MA. Evaluation of a four month rehabilitation program for stroke patients with balance problems and binocular visual dysfunction. NeuroRehabilitation. 2016;38(4):331-41.